Project Greenhouse is a school-wide STREAM project whose purpose is to build a functional greenhouse, power it with solar panels, plant seeds that will grow to seedlings that can be transplanted to a large garden, and harvest the crops to donate them to various food banks. 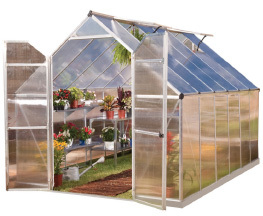 Students will plan, design, and construct the greenhouse, complete with solar panels for power, storage areas, a self-watering system, and a fence. The greenhouse and garden will be located on the campus directly behind the science classrooms. Students will be empowered in the process from the beginning, gaining experience in budgeting, safety, planning and design, construction, accessorizing, planting, harvesting, and disbursing products. Students will have a hands-on opportunity to carry out cross-curricular studies in biology, environmental science, and physics, mathematics, and engineering, and technology, stressing the importance of the mutual interaction among the sciences and the simultaneous expression of humanistic values. Preparing the field, planting the seedlings, caring for the plants, harvesting the crops, and disbursing produce to local food banks will be handled mainly by the students, with a team of adult moderators/teachers for guidance.